VIKTOR & ROLF. Luxury Unisex Sunglasses. Handmade in France. NO CASE, ONLY THE LENS MANUEL. Due to differences in lighting, fabric textures, and your computer settings, colors can differ. We try to describe the color exactly as the manufacturer has described it. Miu Miu Sunglasses 04QS 1AB0A7 Black Gold Grey Gradient are fabulously embellished with some eye-catching jewels around this retro cat's eye style. Thin metal arms and bridge enhance the vintage appeal of these truly unique Miu Miu sunglasses. Model: Versace MOD 3157-M GB1. MPN Versace MOD 3157-M GB1. Case: Authentic Versace case. Arm Length(mm) : 135. Style Cat Eye. Lens(mm) : 52. 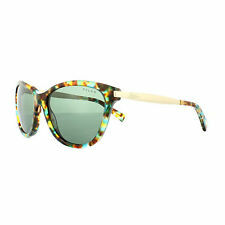 Ralph by Ralph Lauren Sunglasses 5201 145671 Havana Spotted Teal Gold Green are a lovely cat's eye style with a nice blend of acetate front and metal arms that feature a Ralph engraved signature at the temples. Matching temple tips complete the chic look. Bvlgari Sunglasses 8178 901/6G Black Light Grey Silver Mirror feature hand enamelled scales on the edges of these gorgeous cat eye sunglasses in homage to the Bvlgari Serpenti theme. Thin curved arms in the curve of the snake continue the theme with panache and style. Gucci Sunglasses 3804 CRX HA Havana Gold Brown Gradient are a chic elegant cat eye frame with a real touch of class and glamour. The exquisite detailed metal temples sit next to the iconic interlocking GG logo and the swooping curves of the cat eye are gorgeous. 100% AUTHENTIC TOM FORD "GRACE" TF349 64J LADIES SUNGLASSES - OLIVE HORN. MODEL # TF349 COLOUR # 64J. TOM FORD "GRACE" SUNGLASSES. TOM FORD CERTIFICATE OF AUTHENTICITY, CLOTH AND ALL THE GENUINE TOM FORD/MARCOLIN PAPERWORK. Miu Miu Sunglasses MU02SS VA43C2 Dark Grey Grey are a sensational design with triple layer butterfly shaped frame in contrasting but complimentary colours. They really are truly stunning, straight from the catwalk but still eminently wearable sunglasses. Excellent condition. No scratches. Genuine Dior. Bought about a year ago worn only a couple of times. Brand case included. 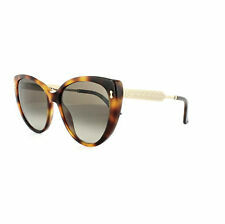 DIOR Sunglasses Wildly P7JKU with front metal matt black color and contrast acetate frame color light havana. Butterfly oversized elegant shape. Diesel DL0124 Unisex Sunglasses Violet. - If the item has labels missing. - If the item has been worn. Unit 2, Blackthorne Point. Top Labels Online. - Your order number. We will be more than happy to help you. DOLCE & GABBANA SUNGLASSES DG6109. GREY PLASTIC, PINK SEQUIN TRIM DETAIL. THIS EYE CATCHING DESIGN, IT IS SURE TO MAKE HEADS TURN. A STANDARD CASE WILL BE SUPPLIED. Model:MK6039F - Abela II. Colour:314513 (Dark tortoiseshell with brown lens). Miu Miu Sunglasses 53RS UA50A6 Amaranth Pale Gold Brown Gradient are a lovely vintage inspired cat's eye style with a really lightweight metal frame and plastic enhanced top rims. The thin metal arms with Miu Miu engraved logo are matched to the quirky metal bridge for a fun and very trendy look. Bvlgari 6082 376/8h sunglasses have a rose gold and violet frame with a violet gradient lens. 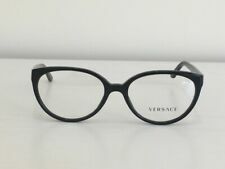 They are made of metal and plastic and have a cat eye shape and are for women. Bvlgari Sunglasses BV8193B 504/13 Dark Havana Brown Gradient have a metal & plastic frame which is a cat Eye shape and is for women. Michael Kors Sunglasses Adrianna 1 1010 1100T3 Black Gold Grey Gradient Polarized are a luxury cat eye style with lovely rounded lenses surrounded by plastic with the metal rims, bridge and temples setting off the chic sophisticated look. Maui Jim Sunglasses Sugar Cane H783-24C Transparent Mocha HCL Bronze Polarized are a lightweight nylon frame with spring hinges and featuring Maui Jim's superior polarized lenses with supremely lightweight Super Thin glass lenses for a comfortable frame with amazing lenses. Michael kors tia 1022 118525 sunglasses have a black and silver frame with a cobalt mirror lens. They are made of metal and plastic and have a cat eye shape and are for women. Miu Miu Sunglasses 10NS UBR3D0 Light Havana Gold Brown Gradient are a fabulous retro cat's eye style with a truly unique silhouette and classy vintage appeal. Thin metal arms and bridge perch atop the geometric chunky frame to great effect. Roberto Cavalli Sunglasses Homam 900S 52F Dark Havana Gold Brown Gradient have a gorgeous marbled tortoiseshell effect finish on the highly popular curved cat's eye style that sweeps into sleek metal arms featuring the Cavalli crest and finished with matching temple tips. Prada Sunglasses Cinema Evolution 53SS 2AU6O0 Tortoise Brown Gold Mirror have a unique geometric shape with cat's eye lift to the corners, one of the frames that is leading the trend into geometric unusual shapes right now. The thick plastic front frame blends nicely at the cat's eye corners into the metal arms with the metal continuing across the top of the frame and across the bridge in one smooth piece that heightens the luxury feel of the frame. Bvlgari Sunglasses 8178 1117/7E Violet Raspberry Violet Pink Silver Mirror feature hand enamelled scales on the edges of these gorgeous cat eye sunglasses in homage to the Bvlgari Serpenti theme. Thin curved arms in the curve of the snake continue the theme with panache and style. DOLCE & GABBANA SUNGLASSES DG6109. THIS EYE CATCHING DESIGN, IT IS SURE TO MAKE HEADS TURN. BLUE PLASTIC, BLUE SEQUIN TRIM DETAIL. EYE SIZE 50 X 18 TEMPLE LENGTH 140MM. Miu Miu Sunglasses 10NS HAH1X1 Havana Cream Grey Brown Gradient are a fabulous retro cat's eye style with a truly unique silhouette and classy vintage appeal. Thin metal arms and bridge perch atop the geometric chunky frame to great effect. Tiffany Sunglasses TF 4159 82753B Havana & Crystal Blue Brown Gradient are a luxurious cat-eye acetate style with Tiffany blue accents. The flat metal temples feature diamond point which is the new symbol of contemporary luxury and inspired by Tiffany's Home & Accessories collection. Model Number: GU 7162 WHT 34. DESIGNER SUNGLASSES. MODEL IS BURBERRY BE 4133. COLOUR IS KHAKI TOP MUSTARD 3362/13. BURBERRY SUNGLASSES. GENUINE BURBERRY SUNGLASSES MADE IN ITALY. Michael kors evy 1023 117411 sunglasses have a satin black frame with a grey gradient lens. They are made of metal and plastic and have a cat eye shape and are for women. Model: Versace MOD 3191 GB1. MPN Versace MOD 3191 GB1. Case: Authentic Versace case. Arm Length(mm) : 140. Style Cat Eye. Lens(mm) : 52. Model Number: GU 7230 PUR 58. DESIGNER SUNGLASSES. Auctiva's FREE Counter. Case may differ to photograph. Auctiva Free Image Hosting. Michael kors ina 1020 11645a sunglasses have a gold marble and gold frame with a bronze mirror lens. They are made of metal and plastic and have a cat eye shape and are for women. Christian Lacroix. Model Number: CL 5030 008. AUTHENTIC Designer Sunglasses. Presentation Box All Paperwork.